When most skiers think of BC, they think of "Whistler-Blackcomb"-unless, that is, they happen to actually live in British Columbia. On winter weekends, legions of snow-lovers in BC's major city, Vancouver, steer the family vehicle eastward to the Okanagan, a recreation playground that's still not well known outside its driving-distance radius. The Okanagan has four mid-sized ski resorts: Big White; Apex; Sun Peaks; and Silver Star. 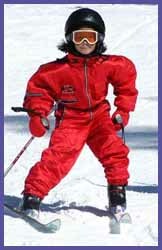 All of them offer Xtreme family-friendliness, less-crowded slopes, and affordable price-point. As for the snow... two words: champagne powder. Dry; feather-light; abundant; and almost all of it 100% natural! Big White ski resort is a 45-minute drive southeast from the town of Kelowna (-- see Getting There), and - to judge by the amount of new lodging-- has been sufficiently "discovered" to have a real estate boom. Big White is an up'n'coming place. "It's the snow" is the slogan the resort promotes: but for my kids-when we visited at the end of the season, in April-the slogan might also have been, "It's the uncrowded slopes", "it's the gladed runs", "it's the ski-in, ski-out", and "it's the private hot tub on the balcony". As for the snow: it was divine, and so abundant that resort staff sighed with regret that the slopes were scheduled to close after that weekend. Because we visited late in the season, we missed out on some of the family activities for which Big White is known, such as nighttime bonfires and ice-skating. And so we arrived at a rare consensus: all three boys want to return at Christmas-time. In a nutshell, besides the great slopes, Big White's top points for families are: family activities; no line; fun terrain park; excellent kids' programs; and --terrific for any parent who's lugged kids' ski gear around-every single place you stay is Ski In-Ski-Out. Big White has runs for all levels of expertise, and you'll seldom if ever wait in line. My family of intermediate skiers was in its element but those who want a challenge can try the new cliff chairlift for 'big mountain' bowls and some straight shot fall line skiing. The Stats: Big White has a summit elevation of 7608 feet, vertical drop of 2550 feet; patrolled area of 2765 acres; 118 marked trails, totaling 53 miles (and the longest run is 4.5 miles.) Breakdown of runs is: Easy -18%; Moderate -56%; Difficult -26%. And a bonus: Big White has 38 acres of night skiing. Points of pride: gladed runs; bowl skiing; good grooming; reliability of the snow. Kids Programs: the Kids Center in the village center has daycare for ages 18 months to 6 years, and has its own on-site kitchen for lunch and snacks. Meanwhile the award-winning Ski and Snowboard School has SkiCubs, for ages 4 to 6, and SnowRiders Ski and Snowboard programs, ages 7 to 12; TELUS Flight School and Heavy Metal Shop, takes ages 13 to 18 in the TELUS Park. Terrain Park: the TELUS Park is a highlight for kids, and has its own lift, a Super Pipe and Half Pipe, and beginner and intermediate/advanced areas. It's easily accessible not far from the Village, and even novices can have a fun run. Lodgings: Big White has over 14,000 beds, including hotels, town homes, chalets, and a couple of hostels, all with ski in-ski out convenience. Best news for families are the abundance of town house and apartment-style condos, with full kitchens and maybe even a private hot tub on the balcony. Village: a ski run goes right through the Main Street of Big White's small but convenient village. 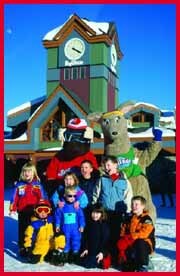 The Kids Center and Ski School are located here, as are rentals, restaurants, video store, and grocery store. Meeting up with family members is easy: just meet under the giant clock. One oddity is the lack of a real family-style restaurant in the village. Yes, families are welcome at several spots; but where's the Tim Horton's? (Fyi: Tim Horton's is a Canadian chain with value prices, and it's an official partner of Big White.) The restaurant where we dined had three items on the Kids Menu: steak, burger, and chicken. Wah? One final point: if you're looking for nightlife, you're probably at the wrong BC ski resort. Price: in general, Big White's prices are good value compared to US resorts. Bookings made with Big White Central Reservations offer discounts on lift tickets and rentals. Family Fun: includes bonfires and fireworks; Family Fun Races; Carnival Night with games and prizes; Family Bingo, and Family Movie Night; skating pond, and the largest mountain tube park in America (-- you'll have to pay to use these, though.) To find out what's going on, check Channel 5 on your TV set. However, because it's close to a large lake, Big White can turn into "Big White-Out". How often does this happen? Depends on the year; 2004-2005 saw very few whiteout days. Whiteouts seldom last more than two or three days. Also, to provide some ski-time even in white conditions, trees have been thinned on the side of the mountain where visibility is best. By the way, even whiteouts have a silver lining: Big White has some of the best ski-trail signage you've ever seen. The drive from Vancouver takes 5 hours in good conditions, but requires much longer-and much caution-- in bad weather. Canadians can fly direct to Kelowna from Vancouver, Seattle, Calgary, Edmonton, and Toronto. Guests coming from the US can take direct flights from Seattle, or connecting flights (with package pricing) from many departure cities. 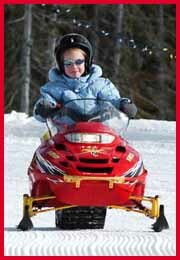 Alaska/ Horizon Airlines has a Kids Fly Ski and Stay Free promotion, from Dec. 1 2005 to April 16 2006. Bonus: guests can visit sister resort Silver Star with a dual mountain package, or by taking a day trip from Big White for $99CDN. Or visit Big White's website at BigWhite.com. ...... Teresa Plowright covers the Travel With Kids topic at About.com, and has also written about family travel for FamilyFun and other magazines. She has three sons and lives on Bowen Island, BC.